A “sole bath" rejuvenates the skin. 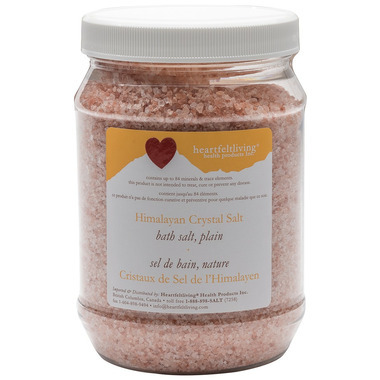 Take a handful of the Himalayan Crystal Bath Salt to start and increase over time. Take a bath for about 15 to 20 minutes, not more than once or twice per week. Do not use any chemical substances. After the bath, allow your skin to air dry. It is also recommended that you lie down for half an hour. For those who find the bath strong, use a lower salt amount in a foot bath for 15 to 20 minutes. As the body’s own energy is more activated by a full moon, the body absorbs more minerals when taking a sole bath during this time. The bio energetic weak points are also harmonized in this period of time. On the other hand, a new moon is the best time for cleansing the body as its capacity for detoxification is at its highest level. Due to a high bio energetic field, the “sole” bath is demanding on the circulatory system. Those who have heart trouble, high blood pressure, or any health problem, should consult a physician before having a “sole” bath.